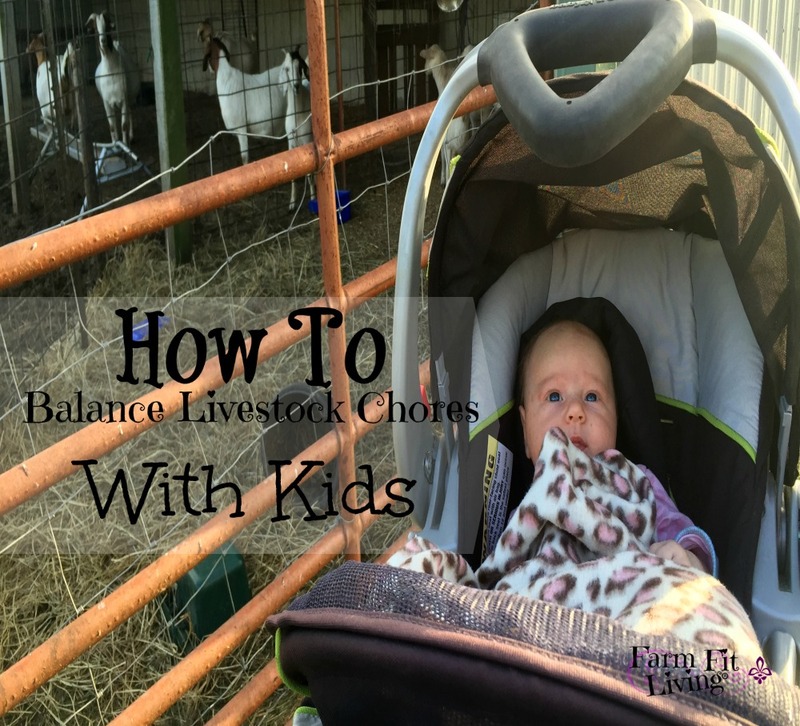 Are you at a loss as to how to balance livestock chores with kids? Livestock chores can be a lot harder with kids in tow. But, it’s can also be a great learning opportunities for little ones to learn. Kids can learn many skills while doing chores. They can also learn a lot about the animals they are helping to care for. When kids around livestock, it’s important to keep several things in mind. The most important thing is safety. Safety is the number one goal of balancing livestock chores with kids. You never know what livestock will do. No animals can be trusted no matter how tame they may appear. So, the key to balancing livestock chores with kids is to know where the kids are while you are feeding the livestock. Accomplishing this balance can be very difficult to do but it is possible. Here are some ways to ensure kids are safe while allowing them to help out with livestock chores. Find an age appropriate chore for your kids. Not only does this keep them busy, but it also teaches them to start caring. Letting them work improves sensory skills needed for proper development. Letting the kids complete a job they can do can also teach them to have ownership of certain jobs. It makes them feel like they are part of the farm when they can own their work. Their little eyes light up when you give them instructions for their job. It can be as easy as lifting the handle on the feed wagon. Or simply holding the hose to fill water buckets. But not all kids are capable of helping out with the livestock chores. For the not-so-mobile kids, a little more creativity is needed. Make them your accessories if the conditions are right. 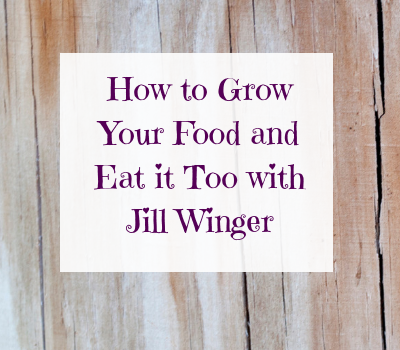 The right conditions are up to your gut feeling. Ask yourself: Is it safe to wear my child around these animals? I wore both my babies while doing livestock chores each day. I own an Ergo baby carrier with an infant insert. I love it because it’s comfortable for me to wear. The babies obviously love it because they fell asleep minutes after starting chores. Baby-wearing may not be appropriate in every situation. I prefer not to wear my baby inside any livestock pens of animals with big horns. If I go into a goat pen, I place her in her stroller. It would be awful if she was horned just on accident by a hungry doe. Ask yourself if the weather is appropriate for the baby outdoors. If it is not, there are other options. This works perfectly if you have a feed truck or tractor with a cab. Strap the car seat into the seat inside the vehicle of choice. Temperature controlled. Radio on. You’ll have a happy baby all through chore-time. This works great if you have a fussy baby and can’t wear her. If the baby is happy, she might prefer playing with toys in her pack’n’play while you work. A pack’n’play can keep baby contained while you work. Include some of baby’s favorite toys. Don’t forget to interact with baby when you walk by. Baby will also be interested to watch you work. You’ll be amazed what she’s learning from you. On a nice day, a stroller is great to have around. Especially with a fussy little one. You can keep them moving by strolling from pen to pen. While feeding pens, I like to have my jogging all-terrain stroller for my little one. This stroller is easy to maneuver around the farm. I can even carry a bucket in the other hand! Strolling helps baby to learn the way around the farm while they are taking everything in. 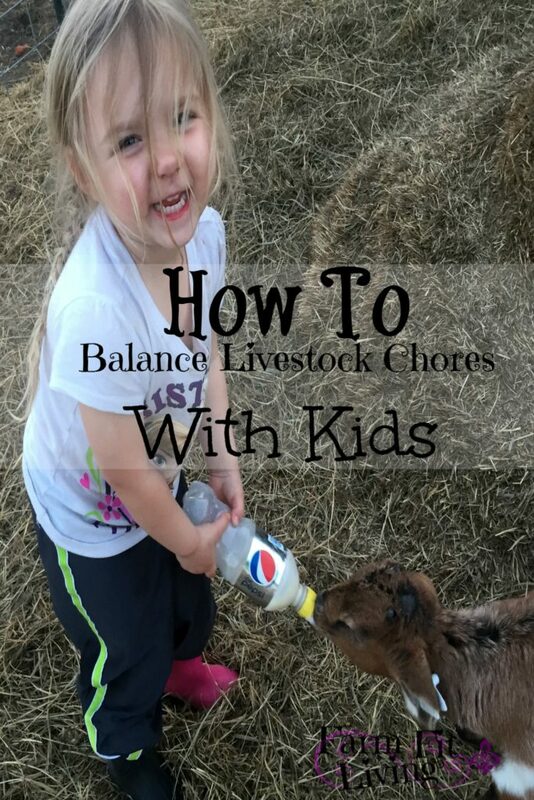 The art of balancing livestock chores with kids is completely possible. But, you must make sure they will be safe no matter what age they are. If your kids are mobile, they may seem harder to keep track of. Give them simple jobs so you’ll know where they are. Babies can be carried, buckled into a vehicle or stroller or stored in a pack’n’play while you work. Chores may seem longer to finish, but they will be finished. One of the most important key to balancing livestock chores with kids is patience. Think of all the lessons, skills and relationships you are building with your little ones. Cherish these times. These are moments all of you will have for a lifetime.